Barbie has a black eye. In yet another twist in the epic Barbie-vs.-Bratz brawl, a U.S. District Court slapped Mattel Inc. with $88 million in damages after tossing out its claims that rival MGA Entertainment stole the idea for its blockbuster Bratz dolls, an embarrassment for the blond teen queen, to say the least. After a two-week deliberation, the jury in Santa Ana, Calif., also found that Mattel was guilty of misappropriation of trade secrets, a serious ethical blow to the venerable toy giant that tacks on the possibility that more damages might awarded to MGA. But don't count on this being the end of one of the longest court fights in toy-industry history. If you include a Mattel's victory in 2008, when a federal judge upheld its $500 million claim against Bratz, the two sides are now tied with one victory apiece. And Mattel is almost sure to appeal the case. "It really is a basketball tournament. It's one-all now," Jim Silver, toy and family entertainment expert and editor of TimetoPlayMag.com. "If (the verdict) is appealable, which it seems to be, then it's meaningless." 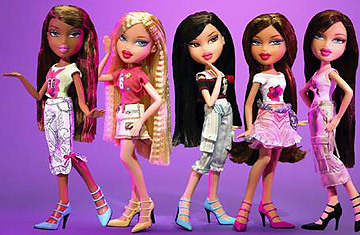 The initial suit began in 2005 over the rights to a particular aspect of the Bratz design, when MGA filed against Mattel for allegedly copying the distinct Bratz eye feature in its new line of Barbies. (That case is still pending.) Later that year, Mattel countersued for $500 million, claiming that designer Carter Bryant, who created the racier, trendier Bratz dolls for MGA, had come up with the idea while he was employed by Mattel to design the more demure Barbies. Bryant joined MGA in 2000, and the company launched Bratz one year later. In July 2008 a federal judge ruled that MGA would pay just $100 million to Mattel, saying that only the first generation of Bratz fell under Bryant's breach of contract. That December, Mattel was granted a permanent injunction against MGA, which meant the latter must stop production and sales of certain Bratz toys. But the injunction was overturned in December 2009, when yet another judge ruled that stores would be able to sell Bratz products until a final decision in the case was reached. Meanwhile, fashion-doll sales for both companies have seen better days. In 2005, at the peak of its popularity, MGA's Bratz brand was doing $1 billion a year in sales, by one analyst's estimate. (MGA is a privately owned company and doesn't disclose its earnings.) That same year, Barbie sales had dropped 30% from 2004, no doubt affected by MGA's newer, hipper doll. By 2006, Bratz had captured about 40% of the fashion-doll market and posed the biggest threat to Barbie since her debut in 1959. Mattel's strategy appeared to be that of any threatened corporation: try to bury the competition in litigation. The only problem: Mattel isn't the only toymaker with seriously deep pockets. MGA founder Isaac Larian is one of the richest men in the business, and the egos involved, possibly even more so than the hundreds of millions of dollars at stake, could tie up both companies in court for years to come. Today it's Larian who may be fighting the losing battle. Bratz sales are way down from their 2006 highs. Time to Play's Silver now estimates the line is driving in $30 million to $40 million a year, based on toy-store shelf space dedicated to the brand. "I don't think the lawsuit had anything to do with Bratz dying at the marketplace," he said. "There were very strategic errors made. Those, along with the parents speaking out about how risqué the dolls were, did it." One of these "strategic errors" was the disastrous Bratz: The Movie, released in theaters in 2007. "There's a reason Mattel has never done a Barbie movie until now," Silver said. "Barbie goes for the safe choice." Long term, that seems to be a winning strategy. Right now, Silver estimates Barbie has probably 90% of the fashion-doll aisle, up from a low point of 60% five years ago. So instead of bleeding money in courts, the companies would be better off spending every dime on market research, as the real winner of the doll-vs.-doll battle will be decided by their customers. "The consumers who are buying dolls don't know anything about a lawsuit," Silver said. "Ninety-nine percent don't know or don't care. They just want to buy the doll their kid is asking for."